Just having returned from a particularly exhilarating annual ASCO meeting, I wanted to quickly share some of the most exciting results from the sarcoma sessions with all of you. Overall, this year revealed exciting advances in treatment of desmoid tumors, as well as PVNS. Additionally, we learned some important information about oral chemotherapy drugs including regorafenib (Stivarga) for osteosarcomas and liposarcomas, and got some great updates regarding immunotherapy for sarcomas. So grab a coffee or another favorite beverage, and I’ll walk you through the most important findings. the progression free survivals then are 2, 3, 5, 6, 9 weeks – so the median would be 5 weeks. Placebo means a sugar pill. To remind you, desmoid tumors are NOT cancer, but still aggressive tumors that cause pain, deformities, and interfere in quality of life for our patients. These tumors can be treated with a wide variety of drugs, including anti-inflammatories and anti-hormonal treatments, all the way up to intensive chemotherapies. We sometimes use oral chemotherapy drugs, including sorafenib (Nexavar), but no therapies are officially approved for desmoid tumors. In this year’s ASCO, the results of two clinical trials were presented that showed very promising results for two different oral chemotherapy drugs. The first study was presented by Dr. Mrinal Gounder from Memorial Sloan Kettering. He reported the results of the Alliance trial where patients with desmoids were assigned to either sorafenib or placebo. Patient who received placebo were allowed to cross over to sorafenib if they progressed. Overall, 33% of patients who received sorafenib had desmoid shrinkage of greater than 30%. However what’s interesting is that in patients who had the placebo, 20% had shrinkage in their desmoids greater than 30%. This means that some patients will have their tumors shrink with no treatment – which is why we often recommend watching and waiting with no treatment for patients with desmoids that are not causing symptoms or are in places that are dangerous if they continue to grow. Now these measurements used size-based criteria, which is always unreliable in desmoids, as many desmoids will die and become inactive but not shrink very much. So they are still analyzing the patients using other methods to better capture benefit, so we’ll have to wait for that information. 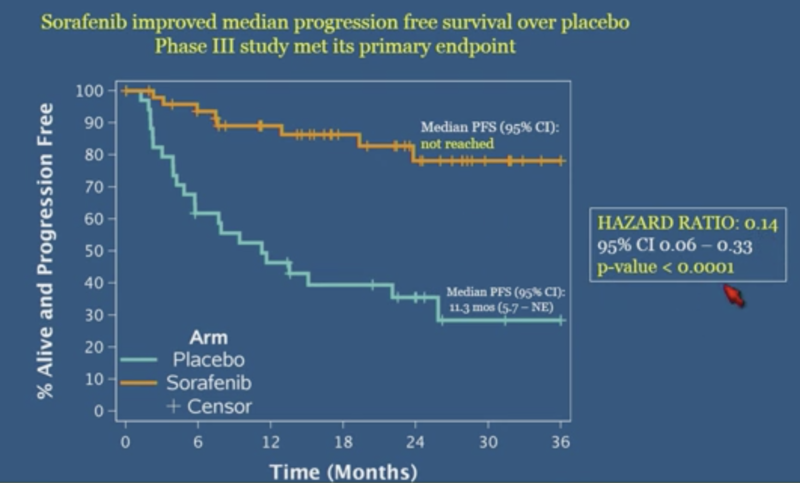 Because of this, a better way to look at desmoids is using median progression-free survival – it took 11.3 months for half of the patients on placebo to progress – and in the sorafenib arm, only about 20% of patients had progressed by 36 months of follow up. So what this means is that so far it looks like the sorafenib is working very well in most patients to keep them from progressing, and with longer time in follow up we will understand better about how well the drug works. The picture below may explain this better – these are survival curves, which show the percent of patients that are progression-free over time – the orange line shows the sorafenib patients and the blue line is the placebo patients. Sorafenib so far appears to be much much better! The next trial that was presented was called DesmoPaz, from our friends in the French Sarcoma Group. In this study desmoid patients were assigned to either pazopanib, another oral chemo drug that we use for other types of sarcoma, or chemotherapy with methotrexate and vinblastine. The treatment lasted for one year whichever treatment the patients received, and then they were followed. In the patients who received pazopanib, 37% of patients had partial responses, compared to 25% of the chemotherapy patients. most of the remaining patients in the pazopanib group had benefit, with stabilization or shrinkage less than 30%, which again is important because of the size-based measurements that are not reliable for desmoids. The pazopanib at the full dose caused a lot of side effects, however even in sarcomas we usually reduce the dose for most patients, and many patients in this study also had the doses reduced. So again, pazopanib is another treatment option for stubborn desmoids that need to be treated. PVNS (pigmented villonodular synovitis) is another weird disease that is not cancer, but again there is overgrowth of the lining of joints, called synovium, due to a genetic mutation in a protein called CSF1. These patients develop bad arthritis in their joints, including knees, shoulders, and hips, and sometimes large bulky masses outside of the joints. When surgery can’t be done to remove the tumors they cause a tremendous amount of pain and function problems, and often can affect young people leading to early joint replacement surgeries. No approved treatments exist for PVNS although we sometimes use an oral chemo drug, imatinib (Gleevec) for patients when surgery is not possible. So this study, ENLIVEN, was presented by Dr. William Tap from Memorial Sloan Kettering, and was a large trial run at many centers. Patients who were not candidates for surgery for PVNS were enrolled and assigned to either pexidartinib, an oral chemo pill that directly inhibits CSF1, or placebo. Patients assigned to placebo were allowed to cross over to get pexidartinib if their PVNS progressed. In patients who received pexidartinib, 39% of patients had tumors shrink more than 30%, including 9 out of 61 patients who had their tumors disappear completely! The rest of the patients had shrinkages less than 30%, with only ONE PATIENT who had their disease grow! In the placebo patients, there were NO patients who had more than 30% shrinkage. They also measured pain and range of motion of the joints which showed significant improvements as well. The only problem with this drug was that there were a small number of patients who had liver damage as a result of the drug, usually this went away with stopping the drug or dropping the dose, however this was the reason why the study was stopped early. This drug will be submitted for review at the FDA and I hope that it will be approved for our patients with PVNS. Stay tuned! First, the REGOBONE study by French Sarcoma Group, presented by Dr. Duffaud. This is a large study investigating the oral blood-vessel blocking chemo drug regorafenib (Stivarga) for patients with four different types of bone sarcomas, including osteosarcoma, Ewing sarcoma, chondrosarcoma, and chordomas. The results looked at 36 osteosarcoma patients who had progressed on standard chemotherapy, and then received either regorafenib or placebo. Patients assigned to placebo were allowed to cross over and receive regorafenib if they had growth of their tumors. Patients who received the sugar pill had progression (growth) of their disease at a median of 4.1 weeks – but those that got regorafenib had a median progression of 16.4 weeks!!! This is really important because to date, there are really very few effective treatments for osteosarcoma if regular chemotherapy doesn’t cure patients. So I will definitely consider regorafenib moving forward for my patients. It is not approved but we may be able to get insurance to cover it with these results, or through patient assistance programs. On the other hand, we also saw the updated results for SARC024 study of liposarcoma patients who received regorafenib or placebo – unfortunately there were no responses (tumor shrinkages) and the progression-free survival for regorafenib patients was no different than receiving placebo. Not good for liposarcomas. Phase III study from China, presented by Dr. Chi. This study enrolled 233 patients with a large number of different soft tissue sarcomas to either anlotinib, an oral chemo drug that blocks blood vessel growth, or placebo. The median progression-free survival was 6.27 months for patients receiving anlotinib compared to 1.47 months for patients receiving placebo. In particular, the drug performed very well for leiomyosarcomas and synovial sarcomas, with median progression-free survivals of close to 6 months. Additionally, they included a whopping 56 patients with alveolar soft part sarcoma (a super rare sarcoma type), and these patients did EXTREMELY well with anlotinib, with median progression-free survival of 18.2 months with anlotinib compared to just 3 months on placebo. These results are particularly exciting because a clinical trial of anlotinib is going on now in the United States for these three types of sarcomas – Leiomyosarcoma, synovial sarcoma, and ASPS – so this drug is available for patients here and hopefully the results will be just as good. There were several studies looking at immunotherapy, so I’ll just mention the ones that I think were most exciting. Engineered T cells for myxoid/round cell liposarcoma – apologies for omitting this in the initial post! For background, myxoid/round cell liposarcoma has a protein on the surface known as NY-ESO-1 in about 90% of patients. We can engineer T cells (our parent immune cells) to be specific for this protein, and then give them to patients along with chemotherapy, in hopes of boosting our immune response against these tumors. Sandra D’Angelo from Memorial Sloan Kettering presented the results from an ongoing study where patients with myxoid liposarcoma had their own T cells harvested from the blood, engineered for NY-ESO-1 and then given back. Out of 8 patients treated, 4 patients had partial responses, and 3 had stable disease! The 8th patient is not yet evaluable for response. These are very exciting results!!! Pembrolizumab plus TVEC – this was a small study of 20 patients treated at Memorial Sloan Kettering. These patients had several different types of sarcomas with soft tissue nodules that could be injected. The tumors were injected with TVEC, which is a genetically modified virus that can kill tumor cells, and boost the immune system reaction within the tumor site, hopefully leading to the immune system being able to recognize and kill tumor cells floating around in the bloodstream or in other sites as well. These patients also received pembrolizumab, the immune boosting drug that blocks don’t-eat-me signals found on tumor cells or immune cells within tumors. 35% of the patients had tumor shrinkage of greater than 30%, with an additional 35% of patients having stable disease. The patients who benefitted included angiosarcomas on the skin, epithelioid sarcoma, and undifferentiated sarcomas. Now these sarcoma subtypes also can respond to pembrolizumab or related drugs alone, so we don’t know whether the virus added anything additionally, but it’s still very exciting to see. Axitinib plus pembrolizumab – I presented the results of our study combing the blood vessel blocking drug axitinib with the immune booster pembrolizumab. Out of 33 patients, 25% had their tumors shrink more than 30%. We enrolled 11 patients with ASPS on the study, and out of those patients, 54.5% had partial response, with another 18% of those had stable disease, with the responses lasting almost 2 years in the patients who have been on study the longest! We also had tumor shrinkages in two non-ASPS patients with leiomyosarcoma and epithelioid sarcoma which is very exciting. Overall, about 40% of the non-ASPS patients at least had stable disease or partial response which is encouraging. We will be expanding the study and enrolling more patients with ASPS so hopefully we will see if these results continue. Sunitinib plus nivolumab – The IMMUNOSARC study is similar, combining the blood vessel blocker sunitinib with another immune boosting drug nivolumab, and the results from their first 14 patients. Excitingly, 42.8% of these patients have had tumor shrinkage, including patients with ASPS, clear cell sarcoma, synovial sarcoma, chondrosarcoma, and angiosarcoma. This combination was a little more toxic with drops in the immune cells that led to sepsis so the dose of sunitinib had to be dropped. More patients will be enrolled so will be exciting to see later results. Current results of PLX9486 plus pexidartinib or sunitinib – As a reminder, most GIST grow because of mistakes (mutations) in the genetic code for KIT. When patients are first diagnosed, the most common place for the mutation to occur is exon 11 (like a mile marker along the highway.) These patients often respond to treatment with the KIT-blocker, imatinib, but over time most patients develop resistance to the drug, because their GIST develops NEW mistakes in other exons, like 13, 14, 17, and 18. This trial was designed to combine drugs together that would block these other resistance mutations. Dr. Andrew Wagner presented a poster looking at the results of this ongoing trial. The data presented looked at responses in patients treated with either 1) PLX9486 alone, 2) PLX9486 + pexidartinib, or 3) PLX9486 + sunitinib (Sutent). For patients treated with PLX9486 alone or PLX9486 + pexidartinib, the median progression-free survival was about 6 months, with over 60% of patients having at least stable disease on any of these therapies. There were only a few patients reported who had received the combination of PLX9486 + sunitinib, so we will have to wait a bit longer to see that data although it looked promising as well at this early time. Selinexor is a relatively new drug, that blocks a protein called exportin-1 whose job it is to shuttle proteins around tumor cells. The SEAL trial, presented by poster by Dr Gounder and colleagues was a Phase II trial of dedifferentiated liposarcoma patients treated with selinexor or placebo. The results of this study showed that patients on selinexor had about 5.5 months of medial progression-free survival with some clear evidence of tumor benefit, although like other sarcomas, size-based measuring is problematic. Lots of nausea but usually mild. So this trial is continuing but looks promising. The trial is continuing with a Phase III portion available for patients. It’s impossible to summarize all of the incredible information that was presented at ASCO, but I think these were the most critical studies to report to you. I’m sure I’ve forgotten something critical but will be sure to post updates if I receive feedback! 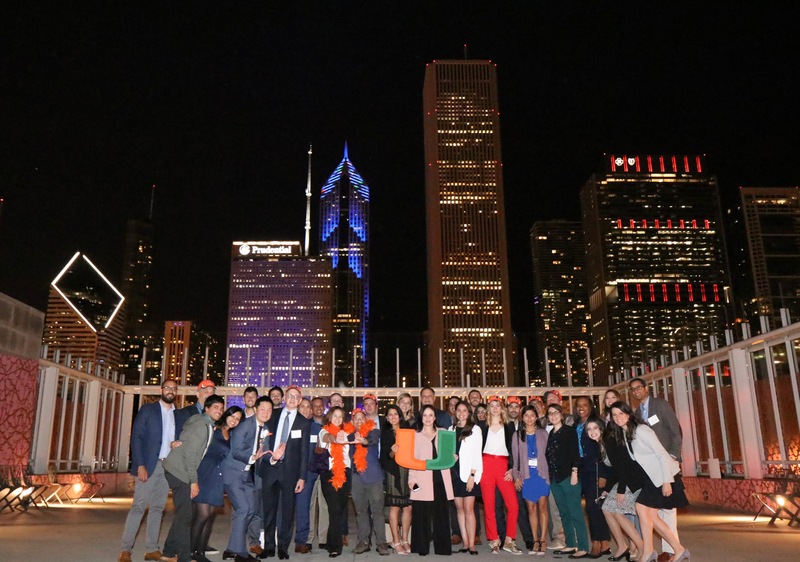 Of course, after all the meetings we had to make sure that our oncologists, nurses, and hard-working research staff had time to recover and celebrate, so here’s a picture from the annual Sylvester Miami Nights celebration. Amazing times! Looking forward to ASCO 2019. Wonderful to hear about these exciting new studies! And great job, as always, explaining in a way that makes sense to the non-medically-trained of us. Great review. Awesome to see the promising results for ASPS. Glad it was a rewarding conference and networking opportunity. You do such a wonderful job of explaining sarcoma research! A very extensive and encouraging update on many of the conditions that challenge us. Your leadership and guidance is greatly appreciated. Thank you for this post. So, I’m supposed to be going on pazopanib soon for my Desmoid (6cm, abdomen.) Does this info mean that there’s only a 37% chance of it stopping or shrinking my tumor? Since only 37% of patients saw a response? 37% of shrinking by size- definitely higher chance of stopping growth… I will have to check the exact numbers from that study. Where do you recommend a patient go for a second opinion when they had a Leiomyosarcoma in their uterus removed 3 years ago and now had 2 small ones (marble and pea size) removed from their lung. Actually removed the middle lob. I would like to get a second opinion to see what follow up treatment if any is available. Check out the list of sarcoma centers on Sarcoma foundation of America’s website (in my links) to find one convenient to you! You definitely have options! Thank you for keeping us updated Dr. Wilky. You definitely have and do a meaningful work. God bless you. Hi Wendy, not sure that much is known about this subtype with immunotherapy- I have one pt I used it on with radiation and it didn’t seem to be a home run. Will have to wait for a bit more data. Have had better outcomes with trabectedin and gemcitabine/docetax combinations – for immunotherapy I would try to find a combination trial. Hope this helps! It does in a way but also not. I am really very concerned about surgery and radiation as well as chemotherapy which leaves me in a no where land especially in hospitals where only traditional treatments are used. I will keep abreast though of all research I possibly can. Please may I ask one more favour, who do you consider to be the world leaders in yor field dealing with sarcomas? I discovered this website today from an LMS fb page. Thank you so much for your simple, straight forward explanations. I am trying to educate myself about LMS to help my friend who now has mets to the lungs. I gound ot strange that she siad her oncologist never told her a stage or grade for her LMS initially or now. Apparently, she asked when initially diagnosed and was told it was incurable so they don’t stage or grade it. This made no sense to me at all. I am trying to kearn all that I can. Thank you so much for this website and your compassion, dedication and knowledge. I will be learning a lot from you. I only wish that you were in Michigan. Thank you! She should be seen at the university of michigan if feasible for second opinion; they have a fantastic sarcoma program.